Appointment scheduling is an important task in any office around the world. This software agenda organizes doctors, staff and patient appointments in schedules that can be configured flexibly. It can be used as a personal information manager (PIM) or to manage the appointments of an entire doctor's surgery. 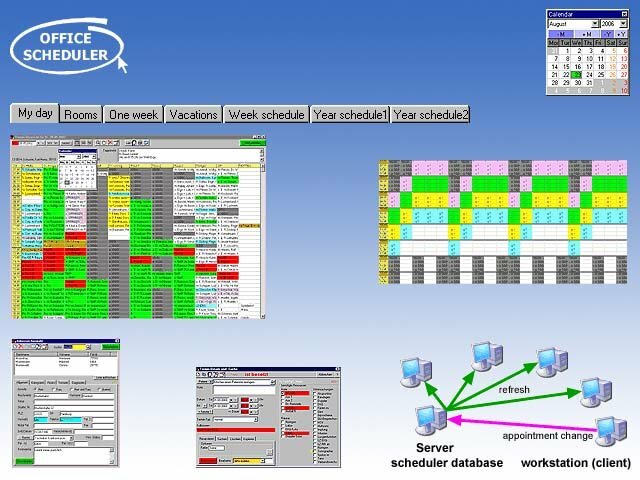 The resources (staff, executives, doctors, assistants, meeting rooms, equipment, therapies) are assigned to scheduler columns in multiple schedule views. Just fix the appointments for your patients and their therapies with a few mouse clicks. Repeated tasks may be scheduled using an appointment series or an entire master week. The information exchange across the network is fast. No dedicated server is needed. This software calendar is being used in hundreds of companies. For example in medical office, hospital, consultory, workshop, therapy center, beauty saloon, hairdresser, spa and fitness.